Below you will see an x-ray of a 5th toe fracture (the pinky toe for those who don’t know how to count toes!!). It’s the most common fractured toe in the foot. Typically it gets “caught” on the corner of a table, chair leg, or bed and fractures at the base of the toe. The bone that breaks is usually the proximal phalanx which is seen in images that follow. I chose to blog about this because a common question from the patient is “why does my foot hurt, if I broke my toe?”. In this particular example, for which I have provided radiographs, the patient was concerned because her toe was fractured, but she had pain in the area of her forefoot which she didn’t consider her toe. If you look at the anatomy of the 5th toe, the first bone (proximal phalanx), is actually part of the foot, and the joint that connects the toe to the foot is before the actual “toe”. When looking at the foot, it would appear the foot is fractured not the toe. 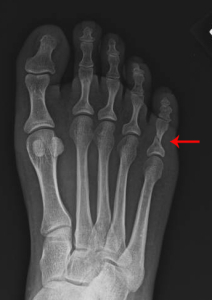 Looking at the pictures below, you can see the fractured bone is actually part of the toe. Should you still run with a fracture like this? Any fracture takes 6-8 weeks to heal from a physiologic standpoint. With 5th toe fractures, they typically heal quickly without much immobilization. In fact buddy taping the toe to the fourth toe will serve as a splint in conjunction with a cushioned shoe. I usually advise 2 to 3 weeks off of running with a mild fracture like this and will gauge the return based in the patients symptoms and a second set of X-rays. If pain is still present I do not progress them back to running. So can you run with a toe fracture? Obviously the decision needs to be made by a physician. Other factors can play a role in the decision making such as displacement, joint involvement, and which toe is fractured. Before making running on a fractured toe, consult your physician. What happens when your feet are “casted” in shoes? 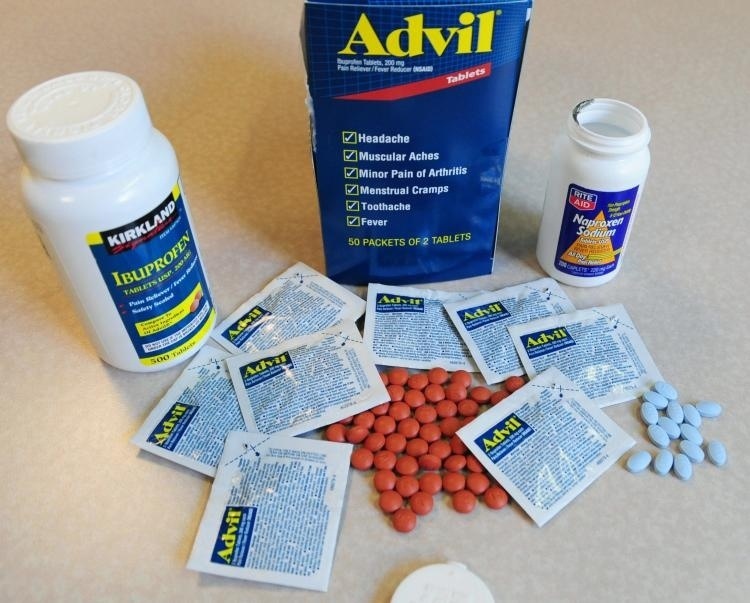 NSAIDS (ibuprofen, Naprosyn, etc) and running. What the literature says. Thanks Dr Nick. Awesome article and straight to the point! Really helpful seeing it like this, having this exact type of break, rested for 5 weeks now from running but still weight trained and biked, I think being pulled over by my dog today may have either re-broken or just aggravated it – just as i thought i could try a run this coming week. I have also experienced the across the foot pain, so good to see what it looks like. Another week of rest it is! I’m approaching 3 weeks without running. I broke my pinky toe running barefoot in the woods. I basically troll medical websites looking for the ones that recommend the shortest rest periods. 3 weeks sounds great! Any recommendations for a proximal hallux fracture? I have a marathon in 3 weeks and just fractured it today? What are my chances of making the race? Did you make it?? I fractured mine today and have a Spartan race in 4 weeks.. I fractured the pinkie toe about 6 weeks ago. It turned blue and was very swollen (much more so than the photo). I could not bear to wear a trainer and for the last 4 weeks have had to wear flip flops. Now able to put foot back into shoes and trainers and gently returned to running the last 2 weeks. Still hurts after a session but hey Ho. Trying to find a wide sports shoe now! It is Friday, we are running our first (and possiblly only) maration on Sunday. My wifes toe looks like the one in third picture. Can she run (and walk) through this marathon and thentake the next two months off? I am glad to read this. I have a fracture of the 4th proximal phalanx of my right foot and the pain I’m having seems to be so much worse than I read that other people have with broken toes. People are walking and exercising after a few days. I haven’t been able to walk on it – buddy taping did zero good. It happened b/c I dropped a heavy laptop (on the corner) on my foot and I think I have a lot of soft tissue injury as well b/c my entire foot is bruised – badly. It’s week 3 and I’m still not bearing weight – hope to be walking soon! I broke my toe 3 days before a marathon late April 2015. I tried running on it 2 weeks later with much pain and so left it for 6 weeks and then tried again and no lucky. By the summer I tried again and believe I rebroke it on a longer run. It’s now 9 months later and I can’t run more than 4-5km without my toe beginning to throb and in pain for some hours after. I’m devastated as running was my passion and my life has been altered by this break, albeit so small. What should I do at this point? I’ve been to my doctor and she said the xray showed a break and an old fracture on the same toe. She said I will live with chronic toe pain for the rest of my life. Is there a possibility of re-breaking and resetting? Or physio? Help!! this is exactly why i try to tell other runners to get it evaluated and treat it with very special care. not only is it one of the two things that we MOST depend on, it can have very long tern serious consequences if left alone too long or too many times and we are all guilty. let me just say this. when a toe is injured other muscles have to over compensate the injury. it is like doing squats on one leg only over a long time period. it will result in gait abnormality and that can be expensive and a much longer healing and treatment window. to answer you, yes, get a podiatrist preferably with sports medicine to evaluate and advise you on your options. good luck honey! i have been there! bumped my toe on friday, ran the dallas half marathon on sunday. I did also run 3 miles one hour after i first thought it was broken to see if it was possible. it did look worse after first run but held up fine during the half marathon [1:32] so only a little slower than what i would expect. I hit my right pinky toe on a lawn chair and was originally told that I had a Non- Displaced fracture of the proximal fifth phalanx and was given a walking boot. The doctor told me to follow up with my PCP in 4 weeks, so I went last Friday and got x-rayed and found out my fracture is now slightly displaced distal second proximal fifth phalanx and the fracture extends into the DIP joint. The only advice my doctor gave me was to continue wearing the boot and if it did not feel better within two weeks he would refer me to a foot specialist. I have put in a request to be referred to a specialist as I am not certain how this injury needs to be properly cared for. I am hoping I do not need surgery. What is the treatment protocol for this kind of fracture? Thanks! Very unlikely if the toe is straight and its involving the fifth toe. Most severe fractures if the fifth toe typical just need reduced as long as they are closed and not open. I really can’t give you advice without seeing the X-ray, but doesn’t sound that bad. My typical routine involves splinting to 4th toe until pin improves and then activity as tolerated. Hope this helps! i have a nonisplaced fx involving the base of prosximal phalanx of the fifth digit..I hit it during the night on the door jam going to the bathroom. at first the dr. said, buddy tape, soak with epsom salts…no xray….well it have been a week and a half and i asked for an xray and it was fx..as stated above…the dr. wants me to get fitted for a wooden shoe, he said a big one is an over kill…what do you think? will i still be able to walk with the shoe? We are on holiday & my 9-year old son hurt his big toe playing football (soccer). 15 months ago he had a fracture in the 2nd phalanx of that same toe. Currently the bottom side of that phalanx is bruised and swollen (when he hurt it a year 1/2 ago it was much more swollen & bruised). X-ray doesn’t seem to show anything, only a faint line that I think is the old fracture. Doctors here in Spain did “buddy taping” & recommended crutches for a week & then slowly resuming activities. Does that sound right? Can something else be causing pain/swelling? I hit my left pinky toe with luggage at the airport a week ago. Ran a 50k on it two days later. Finally got xray-ed yesterday when I got back home (places in Texas wanted $200+ up front for me to walk through the door), ran 45 minutes on the treadmill a few hours later. Today the radiologist report came in – oblique fracture of distal phalanx left fifth toe. Follow up with orthopedist. Well, 4:30 on a Friday afternoon isn’t a popular time to make appointments, lol. Earliest I can get is next Tuesday. Is this something I can run on? Hate to stay in all weekend if I don’t have to! Obviously I can’t give medical advice but can say this. Distal phalanx fractures, especially of the pinky toe, are not a big deal. All 5th toe fractures typically go on to heal with no issues. I don’t routinely even get serial X-rays on them if the toe is not painful or swollen. Other signs to look for are if the toe is straight or not. If a patient comes to me and has ran a 50k on a fractured pinky toe and is not having pain, I’m not too concerned. Hope that helps! Thanks for the response! It is still swollen and painful, which is why I got checked out. Just wanted to know exactly what I did. Running on it doesn’t seem to be making it worse but my concern is whether I’m hindering the healing process. Tuesday just seems so far away at this point. Please do NOT self diagnose! We are all guilty of running through the pain. No one has Xray eyes and that is what I tell all my patients. As a runner I do not follow my own advice and a second fracture of the 4th right medial toe was a traumatic fracture that I tried to ignore after a few weeks but as I mentioned to someone else, these are our feet. We do not run with full body weight on any other tiny bone. If there is continued pain and it heals improperly your entire body could become involved in “protecting” that injury. Over time, a gait abnormality can and most likely will occur on some level. NOW you have a serious issue. Not the end of the world but a lot more time “off” than what you would initially think. Food for thought. I know as I am a disaster. I have run after breaking fingers, just did my own reduction and kept going. It was a training run, nothing that important. I was casted both arms as I had a small fx in the left hand as well. I was going fast. That was not as serious as this toe injury has become. I could run with casts. I specifically had them weigh the same. I ended up with a bit of an arm workout. Take care out there. Jammed my big toe into a concrete slab while running yesterday. X-Ray shows “nondisplaced hairline fracture of proximal phalanx first digit.” Toe and forefoot really sore so running right now is out of the question, but can I play this by ear — I mean, can I run or at least bike on it again when the swelling subsides, or do I have to wait for 6 weeks like some websites recommend? Do I risk permanent injury by running on it too soon? Thanks, and I realize you are not offering professional medical advice. Guess what I’m asking is whether you can apply the logic of the above article and discussion of the pinky toe to the big toe — running or biking on it sooner rather than later, pushing active recovery a little bit faster? If it’s involving the joint (1st MPJ) then risk could be long standing arthritis of the great toe joint. Hairlines usually aren’t problematic and if not displaced usually just treat them symptomatically by increasing activity as one feels better. Control swelling early. This is not I intended to be medical advice. 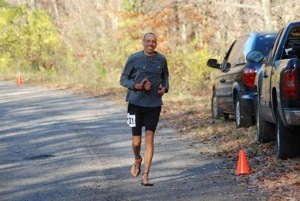 I’m back in my vibrams after 2 successive 4th MT fractures. 12 weeks of walking barefoot (carefully and vigilant), buddy taping made the pressure worse for me, continued to train everyday as if I was running but adding leg, glute workouts, adding more weight as tolerated, into my Nike Free’ so my toes could splay (brooks connect were tight) and went to mizuno wave then finally back to vibrams! I could only go 5 (was worried I was moving too rapidly) but everything is fine today! I wanted to add this detail. I’m pretty strict about keeping movement going with an aligned fracture but the first run I experienced one “pop” of intense pain that resolved quickly. The following day there was new bruising (I iced it) but no pain. I’m fairly certain it was just scar tissue. Make sure you really keep those joints mobile! I broke the 4th toe, adjacent to the pinkie toe, on my right foot 4.5 weeks ago. Just two days ago, I am finally walking without pain, without anchoring it. Ironically, I slammed it into a heavy mirror that was leaning against the wall, the day AFTER running a half marathon! While no xrays have been done, I knew it broke, because I could move it any way I wanted once the initial pain subsided (like rubber, but no real resistance). It also was bruised and swollen. Even from the beginning, I had no major issues, unless it wasn’t anchored. It spent the first 1.5-2 weeks anchored to the toe left of it, about the same to the pinkie, after that. It spent the remaining time anchored equally to both (all three). So, I want to run the turkey trot drumstick double (15k total). I’m nervous, but it is no longer requiring anchoring. I have eight (8) days before the race. Should I do a practice run? If so, should I tape them while I am running? I have been super careful, and stopped any sort of training to preserve it. The half marathon I did gives me enough confidence that I can handle it otherwise. Would you take the risk? Thank you in advance! Thank you for sharing this information. It helps to better understand my own distal phalanx break – a comminuted fracture. I rammed my pinky toe into a doorway about a week ago and I just got xrays yesterday but I don’t wanna wait, only because I am a very impatient person and school starts tomorrow which means first period gym, should I tell my teacher I can’t run for Thursday and Friday? Its still all swollen and bruised and even crooked! My mom was looking at my Xrays and told me my pinky toe bone looked crooked, is that normal? I’m freaking out rich now, AGHHH!!!! Can you upload the X-ray ? Hello. How do I know if surgery is the best option for a fractured/displaced pinky toe? It is fractured so that the left pinky toe is bend outward. Immediately after it happened, I went to the ER where they took an X-ray. They sent me home saying I did not need surgery, just buddy taping and rest. 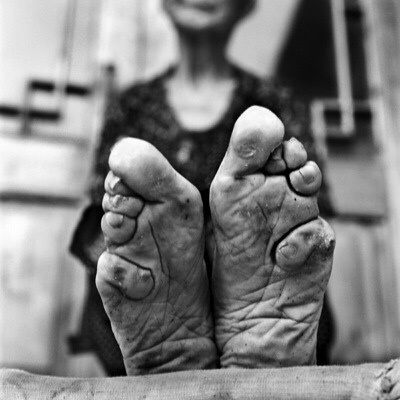 I followed up with a podiatrist five days later, and he said I need surgery to realign the bones. I would prefer not to have surgery, but am unsure with the conflicting feedback. I am an avid runner with half marathons scheduled for March and April. Thanks in advance! Hey. Hope I’m not too late. In 13 years I’ve never surgically fixed a 5th toe fracture. Not that it’s not something that could need done, but it’s rare. Most are reducible. As long as it looks straight clinically and the X-rays correspond one would be fine. Hello my mom is 55 years. She had fracture on her right foot 4th toe . Doctor splint 4th and 3rd finger. Now she is her 6th week rest for foot. She is still having pain. Can you please comment about this. It is not uncommon for someone to have pain after toe fracture for 6 to 8 weeks. Until becomes very swollen and does continue to be sore as it’s healing. I would still recommend having someone follow it with an x-ray but this is certainly not uncommon. Broke my pinky toe 2wks ago, broke in two places, had x-ray and had the toe put back in place, still very painful when walking, been icing & elevating but difficult fitting shoes on, been wearing shoes without an inner sole. Away on a cycling holiday in 10days time hoping to fit my bike shoe on, by putting your foot in a shoe would this damage the toe or push it out of place again. I currently only have it taped to next toe, should it be too the 4th toe? I’m missing lots of my running events, half marathon coming up 4th March hoping to run that one, but no PB which i was hoping for.. Unlikely that putting it in a shot will damage anything. It may be painful as broken toes will stay swollen for several months. The only way to really disrupt the position would be to catch the toe on something or bang it. Good luck! I’m now months post fracture to 4th toe and it is still giving me grief. If it’s cold or in a shoe it becomes very sore and numb. it doesn’t cooperate well unless I run frequently and afterwards it continues to hurt. Unfortunately this was my longer foot so I have to buy two separate shoe sizes to accommodate. I hate to keep pushing forward months afterwards but I can’t imagine how this could be corrected. It’s a 4th toe! Also beware of surgical intervention as I had an orthopedist try to schedule a surgery on my right pinky finger with exposed wires. Seeking a second opinion it needed buddy taping and time, not surgery and I have full use of it now. Seek second or even third opinions if it sounds radical. I have a fractured proximal phalanx 2 weeks ago. My fracture looks almost exactly the same as the one in your article. I am a triathlete. My question is can I continue swimming and biking while the fracture is healing. The foot is achy all the time, and I do not notice any additional discomfort while biking or swimming. Can’t give you advice so this is not medical advice directed at your specific condition, but yes someone with a toe fracture as pictured in my blog post can function with no worries in terms of swimming and biking. If it’s not painful I would encourage activity as tolerated. I haven’t been to the doctor, but I stubbed my baby toe pretty bad and it was hard to walk for a few days. I noticed midheal that there was this white little circle dot in the middle of the bruising. What is it? it is still there after the bruising is almost gone. I hurt my pinky toe three weeks ago. I went to the doctor and he said he couldn’t see anything on the x-ray other than a little spot that could possibly mean a tiny fracture. I am still having pain with every step and it’s very swollen and hit gets red off and on through the day. He thought I would be fine in three weeks but I’m definitely not. Is it normal to still have pain and swelling? I can wear a running shoe but that’s the only kind of shoe that I can tolerate but still have pain. At what point do I just run anyway since it hurts to walk and running wouldn’t be any different… or would I be injuring it more even though nothing showed on the x-ray?